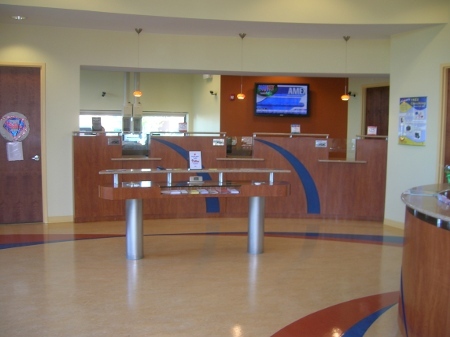 Phoenixville Federal Bank - Work performed by K&L Woodworking, Inc.
Phoenixville Federal Bank & Trust is a chain in the Philadelphia area. 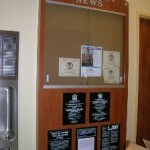 This particular branch is located in Limerick, PA, and houses a variety of Plastic Laminate Casework produced by K&L Woodworking. The most memorable of which was a radius coffee station with plumbed in water hookup. 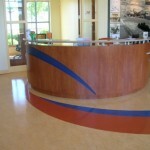 This particular unit was challenging due to it being round and tapered, from top to bottom. This unit also required us to inset a blue accent panel. 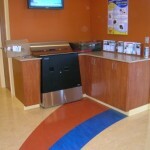 To match the complicated coffee station, we also produced a radius Teller Counter. 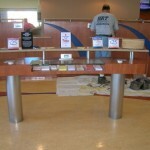 The Teller Counter required the same blue inset panel design and featured a stone top on risers. 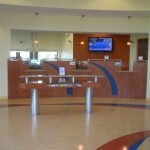 In the center of the lobby is a radius check desk which rests atop metal pillars. Countertops throughout this project are a mixture of Silestone (Amirillo Palmiro), sub contracted through Classic Rock, and Solid Surface Material (Ginger Root by Formica Classic Solid Surface) sub contracted through Pence Countertops.